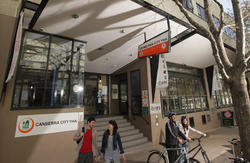 We are located in the heart of Canberraâ€™s China Town, 3.5 k north of the city centre. Hostel facilities include air conditioned/heated rooms (linen provided), a fully equipped kitchen, barbecue on the back deck, broadband internet and self service laundry. We also have a small selection of books (book exchange) in our internet room. We also have WiFi through Everywhere Internet. Take the bus from Civic from platform 8, City bus interchange. On weekdays numbers 200 (express), from 50 to 59, 30, 31 and 39. On weekends 980, 932, 956, 958 and 939. The number of Canberra Elite cabs is 132227 and fares are approximately $12 from Civic, $25 from the railway station and $27 from the airport. Guests arriving at Canberra Railway station can catch an ACTION bus (every 15 minutes, Route 200, express bus) from outside the station. Guests arriving at Canberra Airport will need to catch the Airliner bus from the airport to Civic and then go to platform number 8 as above.